This stand up paddleboard rack is a high-end product designed to store SUPs on docks and piers! It's built specially to store your paddleboards outdoors in salt or fresh water environments and withstand the elements for years. Leave your paddleboards at the water's edge in this rack and you don't have to carry them back and forth every time you want to use them. Marine Grade Outdoor Storage. The rack is made from King Starboard which is a specialty plastic designed for marine applications. The King Starboard construction means these SUP racks can be left out in the sun and salt water for years without fading, warping, or corroding - they are zero maintenance. 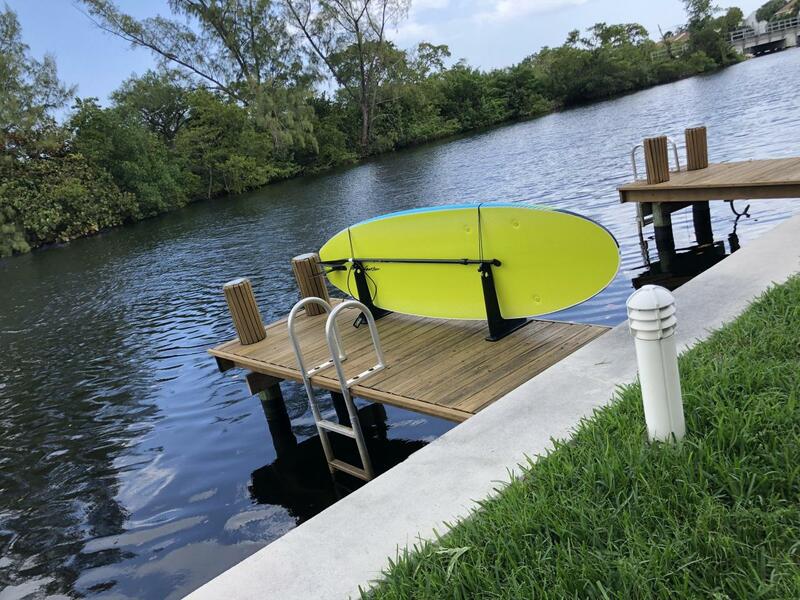 We've seen hundreds of SUP rack designs here at StoreYourBoard, and we can confidently say this is one of the best designs specifically for long term outdoor use on docks and piers. What SUPs does it fit? SUP Thickness: each storage slot fits a paddleboard up to 4.5" thick. For Thicker SUPs: we offer a version of this rack that fits SUPs up to 7.5" thick, such as Inflatables or Touring and Race paddleboards: Dock and Pier Rack for Race and Touring SUPs. Should you add Rack Support Arms? The standard rack is mounted to your dock or deck with screws or bolts. If you prefer not to permanently mount the rack you will need to select "Yes" to the Rack Support Arms in the checkout menu. These arms allow the racks to stand upright on their own, without being anchored. If you select "Yes" you will receive 4 support arms. The Rack Support arms are shown in the image rotary above. Mounting Options. These racks are freestanding but have the option to be permanently fastened down as well. There are (4) pre-drilled holes in the corner of each rack that allow you to easily bolt down the racks to your dock or pier. We recommend using medium to large sized wood screws or lagging bolts to fasten these racks down. Lock Compatible. Each rack arm incorporates cut-outs for looping cable locks or dock locks through (sold separately). This feature is especially useful if you permanently bolt your racks down. With your racks permanently installed to your dock and your boards locked to the rack, you have a secure, locked SUP storage system so you can leave your SUPs outside. Bungee Security Strap. These racks have an integrated bungee cord that secures your SUP down and prevents it from flying away on those gusty days out on the water. Paddle Holders. Another great feature about this rack is that each rack arm also doubles as a paddle holder. The top of each rack arm has a U-shaped cutout that is perfect for cradling your paddles. Thickness of Storage Slot = 4.5"
Hey! This is Josh from StoreYourBoard.com, here today to talk about our SUP Dock and Pier Rack. This is our top-selling rack for outdoor use. A lot of people use it on the dock, pier. People use it on a deck, even just the flat surface on your lawn. Great, great outdoor storage. It’s made from King StarBoard, which is basically the premiere ultra-weather proof material. It’s basically a polymer composite material. It’s what the deep sea fishing boats use for all the cuddies, in their cabin, in their helm, along their deck, so this is built for saltwater, freshwater. Anything you throw at it, it’s going to take it, and it’s very maintenance free, so customers love that. It comes in three different sizes, so regular we have the three versions. The SUP right here is in the back slot and then we have two additional. It comes in a single and then it also comes in a double, and then it comes in a white or black, depending on which color you like best. This is kind of the standard. We also have a larger version for more like Touring boards where it would be a wider slot, so this is kind of your slot right here. You got 5.5 inches on the top and it narrows down to about 4.5, so that fits most SUPs. Some of the SUPs these days, they get a little bigger. Some of the Yoga ones definitely the Touring, definitely the Racing ones are larger. Definitely check out our Touring one. We have that right here so we can see much, much larger cutout for your SUPs, so that should fit most any SUP out there. So just, check it out on our website. Right now, this is the standard version. Just to walk you through some of the features. It comes fully assembled, which is really cool. It has a baseplate here. It’s got four mounting holes on either side, so for a dock, you can just screw it in, keeps it really strong. It doesn’t blow over in the wind. Some people use it without them and they say it’s fine. If you kind of want to use it portable, move it around. Some people have used it with some tent spikes, stuff like that on a soft surface especially for a short time some competition, some expos, stuff like that, so that works well also. A couple of other things about the rack. It comes with a plongee to hold the boards in, which is nice. It keeps it kind of secure. To fasten on the other side, you got up and over and then it has a little notch here to catch it so that keeps your boards in nicely. It also has a paddle holder, which you can see is really just a top of these, just kind of a little cup shape and it works perfectly. When you put your paddle next to your board, it sits in there right flush with it, so your next board can fit in. Everything fits great. It also has these holes, which we typically use for locks, so one of our bestselling locks is the docks lock. You will just put this through the hole and then the docks locks come with a container here for the leash plug so that goes around and then you hook your docks lock up and then you have a way to kind of secure it. Obviously if a thief really wanted it, they can get through it, but it’s a very, very good deterrent for keeping yourself safe, especially when you’re not on the dock at all times. Yeah, check it out. This is definitely one of our bestselling outdoor dock and pier SUP racks. Check it out – StoreYourBoard.com. We used these to create roll-away storage for a garage. Very pleased. Excellent storage for my board, easy to install! We needed a board rack that would accommodate the small area on our dock. This fit the bill. Easy to install, very little effort and really like the bungee cords that come with the racks. My only complaint is not providing instructions for installation. Although it’s easy to install, some may like to have instructions. Written by: Edward m. N.
I purchased 2 black racks to hold 2 SUPs. Previously, I stored a single SUP in a dock storage room located upstairs and over my dock. While SUPs are not all that heavy, they are cumbersome and somewhat of a nuisance to haul up and down stairs when not in use. 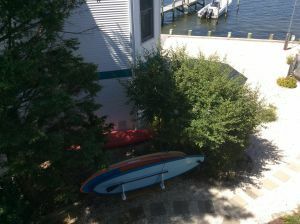 Meanwhile, I noticed that a neighbor had installed a pair of SUP racks, which was suitable for them because they previously stored their 2 SUPs in their garage - quite a distance from their dock. Having only one SUP at the time, I thought of racks as an unnecessary extravagance. That is, until I bought my 2nd SUP. Then, things clicked. No more hauling up and down stairs. Very convenient, easy to install, not obtrusive on a sizable deck. Excellent purchase! Perfect product to store my board on my dock. Bought the 2 SUP version of the SUP rack for docks an Piers. I spent a lot of time looking for SUP holder solution and landed on Storeyourboard. I really like the product even though it was more $$ than I wanted to spend. I'm glad I bought them as it is a very nice solution for outside in summer and inside my garage in winter. Seems like it will be durable at the beach. Terrific quality. Elegant solution. came on time and couldnt be happier! I like the fact that we can move the rack around in the yard and on the dock. we did screw it to some flat boards so it would be more stable when moving on the lawn. It works great and I like the fact that it also holds the paddles. Great product - arrived on time and fully assembled right out of the box. Holds the boards and paddles securely and the stand looks great. We leave them in a shade area and or move them depending on the need. Beach. Dock etc. Great with the legs as they don't move. Best option for storing outside!! Living on the Middle River, we needed a place to store our SUPs so they were easy to access and get into the water quickly. The SUP rack (and lock) from StoreYourBoard is exactly what we were looking for. For now, we just use the optional feet, as not sure where the permanent dock location will be. We still use the individual bags for the boards (sun fades them badly), so a nice add-on would be a cover that wrapped # boards you bought. I know tarps would work, but something with an elastic base that wrapped the entire rack and boards would be great! These are very clever, portable, sturdy and solid construction. I move them from the water and back into storage. I have not even used the extra feet that I ordered. This is a really good and simple option for storing SUPs. Totally recommend. Rack for docks looks Good and easy to use. Material Rack is made of is impervious to the weather conditions. I want to mount it in the front part of my slip, but haven't engineered the way to mount it yet. We bought the "arms" that cost extra. We found that the holes on the arm sdon't line up with the holes on the rack and that the arms don't stay on. The rack works fine in the sand without them. The little boys will be able to get the board s in the water much easier. This is a very well constructed high quality product. Highly recommend it. My paddle boards are easy to remove and when not in use, tie down nicely with the enclosed bungie. All in all a very good product, thank you! Excellent racks for outdoor use. We have 120 foot pier and my wife has been bugging me to build an SUP rack at the end of our pier so she would not have to carry them from underneath the deck. Before I bought the building materials, I found Storeyourboard.com and bought 2 individual SUP racks, so I could stagger them. It took me about 15-20 minutes to install both. I used stainless wood screws and drilled them right into the pier decking. The product is sturdy has made getting out for a paddle super easy. This rack is perfect for storage the paddle boards on your dock. The handy bungee also secures the boards and paddles in place. We have this sitting on our dock and it keeps the boards and paddles in neat order. Wish we had found it earlier! The SUP Rack was easy to install and is extremely sturdy. I bought two singles so that I could stagger them and take up less room on my pier. It has only been a week or two, but exactly what I was looking for. Sturdy design, compact, secured boards on float during 35mph Nor'easter! We were looking for a very sturdy and stable storage rack for our SUP's. We live on a floating home on the Columbia river in the NW and needed to make sure the rack would hold up to our windy and harsh weather in Oregon. Our boards will be stored year round on our dock and this rack is very well made. You have the option to screw it to the dock but after we loaded our boards in it we didn't feel the need to. There was little movement but I'm sure for the winter we will. Besides being made of heavy duty materials it looks nice. I feel you get a great product for the money. We just purchased a second paddle board. Our first storage method which was leaning the board against the wall of the garage with a little packing material on the floor would no longer work for us. I found this storage rack online and it is the perfect solution for our storage problem. We do not have a garage, but have a large wood deck. This was a perfect solution for secure board storage. The rack was easy to install and has a clean, stream-lined appearance. Love them! Well designed and crafted. They work perfectly and keep everything organized. Written by: T douglas W.
Works great. Initially located on ground without stakes and withstood high wind (35-50) without moving at all. easy to load and unload boards for my wife and me. Love it. Totally holds my boards in the most gentlest of ways. Hella recommendja brah. Teamwork. This has saved our boards from careless renters. Perfect for our dock. A no brainer. Easy to setup and use. Keeps a low profile on deck. Better than other high profile rack systems that may block a view. Your product makes storing our SUP board simple. It keeps the board from getting scratched and is easy to put in the holder and to take out. Written by: W Darrow F.
That is what my wife stated. Well designed and easy to use. Creates instant neatness and efficiency of space. I want to store two paddle boards outside and this rack is perfect. Sturdy, but very easy to move... I highly recommend it! Easy SUP Storage for both outside and inside. Attached the 3 board holder to two 2x6 planks and Placed the rack in the shade close to the dock. Will use the rack for winter storage in the Garage. This is a great product, even better than expected. Written by: Matthew s H.
Timely delivery with tracking updates daily, excellent service. Quality racks, look good and easy to setup. 10000% recommend you guys and your product. The rack arrived as promised and took only seconds to set up. The racks were sturdy and well constructed. My 3 SUPs fit well and were easy to remove from the rack to the car. Excellent storage system for me. These are a perfect solution for keeping the sup's in place and protecting them. Thanks! This is a great company to order from. My product was exactly like I expected and the customer service is outstanding! Great job guys!! Great product with good attention to detail and finish. I would suggest raising the what would become the rear board slot and rear support post to elevate the rear board. This would allow easier access to the lifting hold on the rear board. Sometimes we want access to the lift the board on the back side out only. Other than the purchase cost for the two stands, it is a great idea and product. Device worked well. Helped me utilize more space on my dock. We bolted a rack for two boards on a floating dock. It makes it so easy to use the SUPs. Our SUPs must be a little wider as they don't go all the way into the bottom of the stands but it doesn't matter. The bungee cord loop is great to hold down the paddles. Nice product. These sturdy stands were an easy way for us to neatly organize our SUPs. We keep them in a small boathouse next to our dock and had been laying them on the floor or against each other. They weren't terribly stable or easy to step around. These stands helped us get 3 boards easily organized into a section of the boathouse. A worthwhile purchase. The rack is pretty sturdy and will work great on a pier or solid surface. I am currently using on a grassy slope and it just needs a little maneuvering to place the SUPs in, but when stabilized, it works great. It's great to have the SUPs up and organized on a nice rack. Mounted racks on couple of trex boards( have alum. Floor) solid as it can be.. Trying to figure out locking system.. Any suggestions? I like the product so much that I bought a second rack. It makes it very easy to store and handle when using in the lake. I have 2 - 11 ft Yoga boards and the slots are too close for the fins. It's a little tricky when placing them in the holder and taking them out. Must be careful so I don't bend and snap a fin. otherwise good product! Ordered the SUP rack for two boards. Works great. Mounted on one side of 2 place watercraft lift. Love my new rack, very easy to install on the dock. I recommend this rack..
SUP rack--nice, but widen it just a bit. Well made, looks good. My only disappointment is that it needs to be wider at the bottom of the groove in order to accommodate my boards. All they need is to have it another inch wider at the bottom, and it would be fine. Doublecheck how wide your board is before you buy this one. The groove actually tapers from the top to the bottom. One of my two boards doesn't fit inside the slot - it's too wide. I tried to router the starboard, however, messed it up. Didn't realize that this wasn't universal unit. We wanted something to store our spare boards on our deck during the summer. This is a perfect solution for that. We can keep them in this rack in the summer. It doesn't take up too much space on the deck and then stores very easily in the winter. We purchased the 3 Board Rack this winter (2016) and just installed it on our dock this week. It is fabulous! The rugged construction and all-weather durability is perfect and it securely holds our two boards in place. Beyond this, it just looks cool, which is an awesome bonus! Access to the boards is amazing and the built-on paddle holder works like a charm. Would highly recommend this to anyone. Purchased the SUP rack for our dock. The package came in a timely fashion, the packaging was well wrapped, and the rack was easy to install. Very pleased. Highly recommend. This SUP stand is such a great idea - neat storage and minimal space use. Unfortunately the one I purchased is too narrow and it squeezed one of our boards. This rack is exactly what I needed. It is light weight, easily movable (unless I want to attach it to a foundation. I can also take it with me and my paddleboard when I visit family in The Keys! While I'm using this on the floor of a storage shed and don't need all the weather proofing features of it it works great at organizing my boards. I don't have it drilled down and it's no problem. I ordered the single rack and the quality was awesome. As it turned out the size didn't work for my dock but would recommend this product based on the way it was made. I was looking for a storage solution for storing my paddleboards on the dock. This was the perfect solution. Well made, durable and even had cutouts to lock the boards. I used a 30' cable and a lock and know I have my boards stored in the board bags and locked. Would definitely suggest anyone to buy this product and would buy again. Easy to install on my dock. I afixed a cushion on the bottom of the rack where the standup boards are placed. The reason is so that my grandchildren do not Drop the board into the slot and damage the standup boards. I suggest, that on any new model you build you take that into consideration. Finally our boards are no longer scattered, floating away or damaged. We bought the 3 board storage system for two boards and store our paddles in the third stall. Delivery was quick and installation a breeze. We have normal size SUP's . The slots are too narrow . The boards do not completely slide in . Written by: Randall c R.
Installation was very easy. It looks great and will require no yearly cleaning. This product has helped give us more room on our dock as well as protecting our boards. We love it. Have looked for two years for a dock SUP storage system. We love it! Product is wonderful. Had a bit of trouble trying to find out when it was going to be delivered. Tracking numbers never worked but otherwise it came pretty quickly and is a nice product. Needed for sure but you need a credit card, these babies aren't cheap. Not sure what else is as applicable as these board storages racks. They surely will not deteriorate and work as described. There is a little bit of play in them which is acceptable near the top of the rack. I did resize the holes for larger lag screws and install was easy enough. Overall solid rack, a tad expensive but not sure what else a person can do........to store their boards on a dock? This took care of all my large board storage needs. I use it to store 2 paddleboards, plus a windsurf board. It is very easy to move around, but very stable once positioned. I stake it in the grass in my yard close to where I launch the boards off the sea wall on the weekends, and then move it up to my deck to hide the boards from view when I am gone during the week. It is stable both when staked to the grass and when setting on a flat surface like the deck. In the winter I plan to move it into the garage. Great way to keep the boards out of the way but handy! Plus convenient storage for the paddles, and I even throw the life vests on there too. Excellent product-easy to install -protects board from scratching . The attached tie downs r convenient and work well.i would recommend to anyone. I was so pleased with the ease of this product, I shared it on my social media accounts and a few of my friends were also going to order. Now I just wait until the SUP racks for the pontoon are in stock! This rack really helped me clean up the dock at my lakehouse, the SUPs used to just be laying around everywhere taking up all kinds of space. These racks looks like they are built from the same stuff they make the Trex decking from so they should last for a long time without any maintenance - exactly what I was looking for! Does this need to be screwed to the floor or can it be free standing for inside garage? These SUP racks have bases that are stable enough you can place them on an even surface (such as a garage floor) and they will hold your SUPs pretty well without mounting hardware, but the floor will need to be very level, and it won't be as secure since they aren't screwed down. For use on a dock, you would need to use wood screws or lag bolts, and in bare ground, they can be mounted with extra-long tent spikes. Yes, our SUP rack for docks & piers could be mounted into the ground with long tent poles. Alternately, you could just lay down some 2x4s or 4x4s in the grass/sand, and then attach the racks to them. Or you could mount it to a deck or patio, if that is an option for you. Can this rack be hung on the wall? Our surfboard/SUP rack for docks/piers would not work for hanging on a wall. We would recommend our Wall Rack for Outdoors/Docks/Boat Houses, which is also marine grade for use in salt water and other outdoor environments. I have a section of unattached wooden docking that I want to lay on my beach and use the dock storage slots. If I order a double sup storage rack (2 pieces) can I screw them onto the wood slats at the base? It did not appear to have mounting holes on the base. I want to be able to do this and if there are no predrilled holes, is the material able to be drilled? 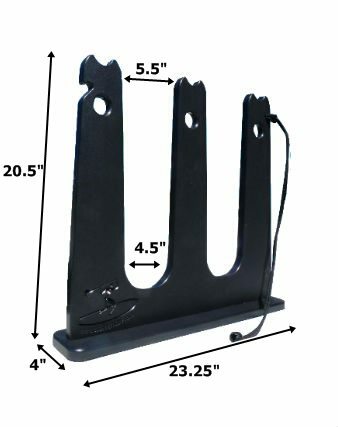 Our SUP Racks for Docks/Piers actually do have four (4) pre-drilled mounting holes on each rack base, for use with medium to large-sized screws or lagbolts if securing the stands in place. The screws or lagbolts are not included with the rack system, so you would have to get those yourself, from anywhere you buy hardware. Your plan to attach them to the your unattached wood docking should work, however. We have many customers using this system in such a way. I know the product has pre drilled holes; however, can I drill holes if the pre drilled holes are not in the right place for my project? We have heard of customers making the pre-existing drill holes larger on these dock/pier SUP, to suit their purposes, with success. You could most likely drill your own additional holes, but I am not sure certain if you would run into any problem with the integrity of the rack if too much of it is drilled into on the underside, and that is something you would be taking on at your risk, we couldn't necessarily recommend it. The rackbase is only 4" wide (by 23.5" long), to give you an idea. The pre-drilled holes are on the 4 exposed corners of each base. There is a picture showing thedimensions of each rack base, with our product specifications, in case that helps you contemplate where you might be placing additional holes. This looks like a good system. Is there a way to lock the boards down to mitigate theft? Our dock & pier freestanding racks are a great way to store your SUPs outdoors! For locking your boards up, each rack arm incorporates cut-outs for looping cable locks or our handy SUP locks through, to secure your SUPs. The freestanding racks themself can also be mounted to your dock/pier, as they have mounting holes on the bottom of each rack arm, should you wish to bolt them down to the dock or pier, and then you can use the SUP locks or cable locks as an additional deterrent. I was wondering if you have a kayak system using a similar system. If not would it be possible to say the middle post out of the two or three board system and use it to store a 18-20" wide kayak? Will this fit a Jimmy Styks 12foot Blue Heron model? These freestanding pier/dock SUP racks have an opening where your board sits that tapers down to 4.5 inches. I believe that your model SUP has a thickness of 5" - if that is so, this would be a tight fit. There is this larger version race/touring SUP dock/pier rack; it has a wider slot that narrows to 7.5 inches, so would accommodate a 5" or thicker board. I would recommend this size instead, though I am basing that on a measurement I saw for the JImmy Styks Blue Heron SUP - if your SUP has smaller or larger thickness, depending on version, you would want to go by that dimension to know which freestanding rack would work better for your board. The length is not a problem, as you set up the arms as far apart as you need to, to accommodate the length of the boards being stored. We purchased boards last summer. The boards are very buoyant and good for beginners. Not sure if they will fit in your standard rack. They are at a summer home so I can't measure their width. Most likely these dock racks for SUPs will work for your boards, but if there is any way you could verify the thickness of your boards, it would help you know better. The racks will fit a board that is up to 4.5" thick. That will fit most boards, but in the event your boards are thicker than that, you would have a problem getting them into and out of the rack. That would be the main measurement to look at (thickness). If you find your boards are thicker than 4.5", you would want to consider the racing/touring board version of these dock racks, which fits boards up to 7.5" thick. How far apart should you have the racks from one another? You can space each of the rack sides of these dock rack/stands as far apart as you need to hold your boards. The best distance apart is really going to depend on the length of the boards you are storing. You usually want about a little more than 1/3 of your board's length in the middle, with about 1/3 or maybe 1/4 of the board on each end of the rack. o if your board is 6 foot long, you might have the rack sides at about 1.5 or 2 feet in at ends. If you are using the multiple board stand, you will need to adjust it to where it will hold your shortest boards being stored. You can check out some pictures on the listings, to get an idea of it in use and give you a visual idea of where the rack sides normally sit. Is the dock rack black or white? Our SUP dock racks are available in a choice of two colors, either black or white. You choose your color preference, and the number of boards the rack will hold (1-3 boards), during checkout, in the drop-down options. Can you make a version that holds more board --we need to store 6 / 7 boards. ThisSUP racks for docks/piers, in ths standard size that fits SUPs up to 4.5" thick, is only made by the manufacturer in 1 board, 2 board or 3 board versions, and they will not be manufacturing a larger version anytime in the near future. One reason is that these are often used on docks/piers, so normally, the 3 board version is the most you would want on a dock/pier, and still have room to maneuver. It is also used by people other places, where they could have more room, so for those instances, you would need to order two sets (or two 3 board racks and one 1 board rack, to hold 7 boards if you needed that many stored). One other note - there is a version for touring SUPsseen here- its the same rack system, but will fit larger SUPs that are up to 7.5" thick; so if you have a few larger SUPs, larger than 4.5" thick at their ends, you would want that version, and that is only available in 1 and 2 board versions. What is the weight of these racks? Please note, these dock SUP racks fits boards up to 4.5" thick; if any of your boards are thicker than that, you would want to consider the SUP stands for Racing/Touring Boards, which fit boards that are up to 7.5" thick, available in versions for 1 or 2 boards. Trying to figure out locking system for these, any suggestions? We recommend using these dock locks with our pier/dock racks, as the dock/pier racks have pre-cut openings that you can run a dock lock cable through, and the dock lock system works well with them. The dock lock system includes one cable, and a jaw clamp to attach to one board - you can order additional jaw clamps for each board you want to attach to the one cable, and it provides a good security solution for your boards. If my board rails are 4.75" will this rack work? TheseSUP racks for piers/docksreally only fit boards up to 4.5" thick at maximu. Even though your rails may be a little thinner on the ends where you would be placing the boards in the rack, it is likely you would run into problems using this rack for your boards even though they are close. We would recommend considering the larger size, shown here, that fits boards up to 7.5" thick, to avoid any problems or them not fitting. Can they stay out in the snow during winter? We checked with our manufacturer on our dock/pier freestanding SUP racks, for their thoughts on how these stands, made from a marine grade material, do in snowy environments, if left out over winter. They said there should be no problem leaving the board racks themselves out in winter. We want to store the paddle boards on the moderate slope beach at our condo project. The beach is not level and it appears the '3 slot SUP rack for docks' would tip over easily. Is that the case? The sloping beach setting is going to be a problem for a lot of freestanding rack systems. This SUP stand will work well on level surfaces, and has mounting holes in it so that one could mount it to a surface; if not a dock/pier, you could put down 2x4s or 4x4s as one possible way to secure it. We have also had customers using long tent poles to help secure the stand. Neither of those solutions is necessarily going to be a good work-around for your beach, but I am mentioning in case it gives you some thoughts on an alternate place to set something up for your boards. The alternatives in freestanding racks (seen here) are mostly going to encounter the same difficulty being set up on a beach that slopes, though for some of the taller racks one could maybe use some weights (say, sand bags) at their base, to help keep the rack stable. Will these fit Bote SUP boards? The most important thing to consider when looking at this rack is the thickness of your board. If you look at the product details on the listing for theSUP rack, you can see that it fits boards that are up to 4.5" thick.Without knowing exactly which type of Bote SUP you have, I can't guarantee that this rack will work as they do have different thicknesses on the specs for the various Bote SUP's i looked at. We do have alarger versionof this rack that holds boards up to 7.5" thick if your board is thicker than 4.5". With the weight from 2 or 3 boards, does it really need to be screwed down to the deck? I'd like to be able to move it from place to place. Anchoring this SUP rack to your dock/pier is optional; it functions as a freestanding rack on most level surfaces. With your boards in the rack, it is fine to use that way (freestanding), and then it can be relocated to other areas as needed. Additionally there are some support braces available to help stabilize the rack on a surface, without permanently anchoring it, that can be purchased as an add-on from the options available for this system. Those would give you some extra support for the rack when its not permanently anchored down. Is there wiggle room on this item for a board thicker by a quarter inch, i.e. 4.75" instead of 4.5"? Our board will fit in the 4.5 inch slots, however I am wondering if this skinnier holder allows enough space to accommodate the large fin on the bottom or our boards. For these dock racks, the fins on your SUPs probably will be fine, if the overall thickness of the board allows the board to fit into the rack as it is. You can see in some photos posted in the listing, and in photos in reviews from customers using the rack, boards can be placed in the rack so that it works with the fins on. You can adjust how you set a couple of boards in the rack system, so that the fins don't get in the way, as well. So most likely you should not have a problem but if your boards are borderline on how thick they are, you probably do want to go to the larger size system, seen here: https://www.storeyourboard.com/sup-rack-for-docks-and-piers-touring-and-race-paddleboards/. But if your boards really are less then 4.5" thick, you should be fine with the smaller size and be able to work with the fins. Would these work on a concrete dock? I would not recommend these SUP racks for mounting to a concrete dock, particularly not a concrete floating dock, as there would be a number of issues in mounting into that surface. As it is, the racks do not come with labbolts or lagscrews for mounting since dock materials and what works for them vary - so if you did consider doing it, you would need to find the proper bolts/screws anchors that would work for that material, and be able to drill into it, and attach/secure the mounting hardware needed, so you need to look at what is recommended for your particular dock surface and its mounting potential (or possible issues) to see if it it could possibly work for you - but it would not be my recommendation. Doesn't look like there is room enough for fins between the boards unless boards are staggered. Correct? Yes, staggering the SUPs is sometimes needed on this SUP rack for docks/piers, to accommodate fins. You could also face fins away from the rack for the boards on the ends, as an alternative. What are the support braces for, and how are the support braces attached to these SUP dock racks? 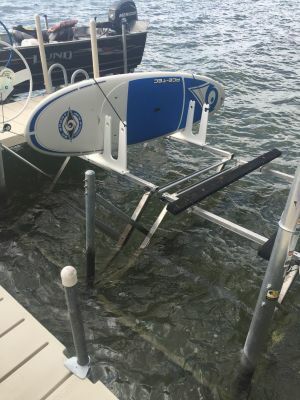 The optional support braces for these SUP stands are available as an alternative, if you are not able or don't wish to mount the stands to your dock/pier surface. They will provide some stability for the stand in that case, though if possible its best to mount the racks. However, if you purchase these stands with the support braces, you will receive 4 of the support arms with your order, along with 4 screws, one for each. You will be attaching one support arm to each side of the stands. The support arms are pre-drilled, so you will need to place them on the stand, and then screw the brace to the stand. The stand is not pre-drilled, so if you wish, you can pre-drill a small hole into it where you will be screwing in the support brace, but that is not necessarily needed. If you get a 1 board rack, is it expandable for a future board? This marine grade SUP rack system for docks/piers is not expandable; it is available in either 1, 2 or 3 board versions, but they aren't built to be added onto. Do you have a picture of the support arms? I want to put this rack on a boat deck. The additional support braces that can be used with this SUP stand can be seen in the 4th picture in the gallery of photo on this listing, and the support part in that picture is circled in red and labeled, to help show what they look like. On a boat, unless you secured the stands with something more than the support brace, the stands would move around, so I really wouldn't recommend them for that use unless you were able to bolt or tie down the stands somehow. The support braces only provide a little more stability for the stands if they aren't secured to a ground/surface, but it wouldn't be enough to help out on a boat, whether docked or moving on the water. Can these be installed on an easy dock? These SUP stands don't actually include mounting hardware since the composition of docks vary, and that means one needs different type of mounting hardware for different dock surfaces. The stands have pre-drilled holes in the bottom of the rack, that you use with whatever hardware is appropriate to your dock, to secure them to it. I really don't know what is recommended for Easy Docks, so you would need to check with the manufacturer, or your owner's manual, to see what can be secured into those and what type of mounting hardware is recommended for it. Can you paint them? If so, what type of paint do you recommend? No, you can't paint these dock/pier SUP racks. This is because they are made out of a special, marine-grade material, called King Starboard. King Starboard is designed to resist heavy UV exposure, and is weather resistant, therefore it repels any type of coating or bonding of any material onto it, in order to provide better protection for your boards. They are, however, available in two colors, white or black.